Note the key word change here is “high-density” in the proposed DC policy reports, whereas it was “higher density” in previous DC policy. When it comes to traffic in Hamilton, increasing (higher) density cannot be said to place equivalent demands on roading infrastructure as lower density areas. 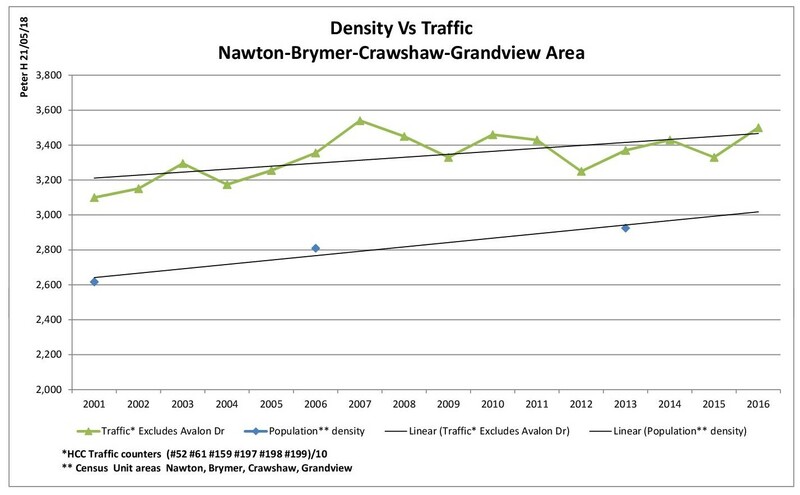 The graph below shows the wider Nawton area population trend line increasing at a steeper angle than the local traffic trends line. What is being suggested in the new DC policy is that the location of a suburban stand-alone 3-bedroom dwelling on a 650m2 section places an equivalent demand on services as a 3-bedroom dwelling in a higher-density urban area. This is where the definition of “high-density” may be clouding assumptions. It is possible that high-density (such as High Rise) has greater costs than suburban density, but urban density is debatable. The traditional traffic assumption is that a new suburban “3-bedroom dwelling equals 10 traffic movements per day”. The proposed 2018 DC policy (p42) for 2-bedroom and 1-bedroom dwellings uses “Residential Conversion Factors – Two Bedroom – Factor = 0.689 & One Bedroom – Factor = 0.477” (p41), which rounds up to 7 and 5 traffic movements per day respectively. This next graph measures, as percentages, the wider Hamilton East area population growth vs traffic actual vs traffic predicted. The above graph includes the actual and predicted Ruakura/Peachgrove intersection counts. We should note that the development of Hilda Ross retirement village occurred around 2002, quickly followed by Ruakura/Peachgrove/Wairere road building. Once the construction work force left this area, traffic movements evaporated to a level below that in 2002, despite the 200-plus dwellings having been built at Hilda Ross village for about 450 people (census mesh block 0896002 & 0896402). Yet at its gate is an oversized road designed to cater for predicted phantom trips (see below for predicted traffic), which by design has a negative/deadly impact on safety for weaker road users in the area. To Summarise: the wider Hamilton east area’s density increased from around 1,900 people per km2 (ppkm2) in 2001 to 2,200 ppkm2 in 2013. For Hilda Ross village, which is dominated by smaller dwellings, there is a population density of over 5,000 ppkm2. However, a negative effect on traffic movements appears to be measureable. Like the assumptions used to predict the 80,000 vpd for 2026, the 0.477 factor for 1 bedroom homes is an assumption, not a fact. This is how peripheral development causes greater increases in infrastructure costs than intensification within the existing boundaries. Something that Hamilton City Council doesn’t seem to understand. I would suggest this is a key factor in their need to increase rates dramatically (along with historic low rates rises by previous councils). Growth in areas like Peacockes and Rotokauri are going to have flow on effects on infrastructure costs in future.